Boost the cool factor in your garden with our new Biker Babe Gnome. She's got an edgy look and an attitude to match! For those who find regular garden gnomes a bit on the boring side, our biker gnome is ready to spice things up. She dons cool shades, a vest, chaps and even a bra-style black top. With her hands-on-hip stance, she's ready to make a stand in your garden, on your porch or in the yard. This tough gal adds a durable design to her too-cool look. She's made from cast stone resin that's known for its incredible weather-resistant properties. 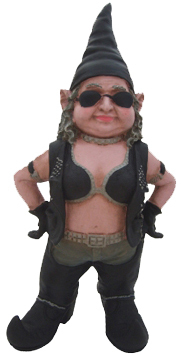 Our Biker Babe Garden Gnome stands 15" tall, so she'll fit in well with the other gnomes in your collection.